This eight-legged steed crosses eight points of the compass. "Never trust something with an odd number of limbs." In Real Life, vertebrates have at most four functional limbs - legs, arms (which anatomically are really modified forelegs), or wings (which are modified arms) - and one tail. If it has more than that, like arthropods (insects, spiders, centipedes, etc), it's not a vertebrate. Some individuals have abnormal numbers due to injury or glitches during development, but additional limbs rarely function properly. Those with less, like snakes and whales, still evolved from four-limbed animals. Of course the fact that there's one standard land vertebrate body plan doesn't stop fiction writers from subverting nature's tropes. This trope may be exactly as old as dirt, for a number of documentaries have suggested that many tales of fantastic creatures could have been inspired by early humans encountering bones of prehistoric creatures and misinterpreting the evidence. For reasons that should be obvious, in modern writing, vertebrates with five or more limbs is primarily a Speculative Fiction trope. They're often very useful in said fiction, in combat or for grabbing. Sometimes justified because A Wizard Did It or because there's no obvious reason why aliens would always have exactly four limbs, but trying to determine the internal anatomy of such creatures may lead to Fridge Logic. While in most cases authors Hand Wave such things, it doesn't stop others from trying. Note: as the subtropes get filled out with three or more examples, they can be TLP 'd and moved into separate subtropes. Contrast Four-Legged Insect, which provides examples of invertebrates with fewer limbs than in real life. A creature, almost always a fur-covered mammal that normally has four legs, has six or more fully-formed legs for no other obvious reason than the Rule of Cool. 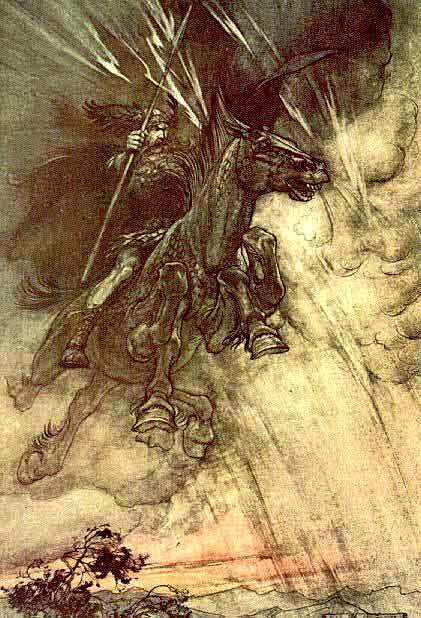 The Norse God, Odin had an eight-legged horse named Sleipnir. Which was born from Loki (shape-shifted into a mare at the time) and a giant's stallion. The extra legs let it run faster. Basilisks, depending on the depiction. Asian dragons, being usually associated with rivers or water, almost never have wings but can have four or more legs (usually depending on how long/powerful the dragon is). For an example, see the river spirit in Spirited Away. More rarely, Western dragons can also look like this. The Catbus from My Neighbor Totoro and the Kittenbus from the OVA of the same universe. The Pokémon Giratina has six legs when in its Altered-Form. The land vertebrates of A Centaur's Life evolved from a common hexapod ancestor but turned out quite close to ours, with many species in common but six-limbed: six legged cows, dogs and horses, and about six main human sub-species, including some with wings and two centauroid forms, one extinct. One of the Eight Kings, the Deer King, is a continent sized deer with 7 pair of legs in Toriko. Most of the Pandoran wildlife in Avatar has six limbs: two pairs of forelimbs and one of hind. The Na'vi do not; this is explained in-universe by their evolution from the monkey-like creatures Jake sees on his first trip out which also have six limbs, but the forelimbs on each side are joined at the elbow - so, two total upper arms and four total lower arms. Presumably Na'vi arms have two parallel bone structures in them all the way down to the hands. This doesn't stop the Wild Mass Guessing that they may be an engineered species, of which this is taken as one of the signs; it's more genetically likely that their ancestry includes a pair of arms becoming vestigial and wasting away than that they joined together. Justified with Stitch from Lilo & Stitch: he is not only an alien, he's a genetic experiment as well. Also, most of the time he keeps his extra arms hidden so muggles mistake him for a dog. Treecats in Honor Harrington have six legs, as do most other native land vertebrates from Sphinx, their homeworld, including the Hexapuma and Sphinx Chipmunk. Ditto the native vertabrates of the planet Safehold from the series of the same name. Also played straight with the native Medusans, a primitive sentient race on the planet Medusa of the Basilisk system. They have three arms and three legs (six total). Jack Vance's Planet of Adventure features six legged beasts of burden. On Gor one of the most common animals is the sleen, often described as looking like a furred snake or lizard, which has six legs. The novel Glory Road by Robert A. Heinlein has horse-analogues with eight legs, on an alien planet. They are used as draft animals. In Anne McCaffrey's Catteni series, there are "loo-cows" that have six legs in order to constantly pound the ground at night and keep the monsters that live underground at bay. Raymond E. Feist's The Riftwar Cycle had a planet where most large animals had six legs, due to taking a different evolutionary path from Earth. There's a six-legged cat, among other things, in The Dark Tower. These animals are called "muties", which is presumably slang for mutant. Later on it's revealed that they are indeed descended from mutated four-legged cats. Thallonian riding beasts in Star Trek: New Frontier. Quite possibly, all Thallonian vertebrates (the Thallonians themselves aren't native to Thallon, so their four-limbed humanoid shape doesn't have to fit in). The Outer Limits (1995): In "Seeds of Destruction", DNA from TX-40, a genetically engineered strain of corn developed by a company called MacroSeed, crossed over to milkweed. The spread of the milkweed's pollen causes both people and animals in the small town of Hobson to develop tumours. In the case of a cat, a fifth leg grows from a tumour on its back. The cat is killed in the process. Star Frontiers had eight-legged land whales. Displacer beasts in Dungeons & Dragons have six legs. And two tentacles. The osquip is a rodent with between six and ten legs. In the Dragon magazine article/story "The Ecology of the Osquip", the wizard Buntleby, who has studied the creatures, speculates that their variable limb number may hold the key as to how the various multilegged, centauroid, and winged quadruped animals evolved. The planets Ungavorox and Grail in Fading Suns universe are known for their six-limber fauna. In Rocket Age some Martian animals, typically reptiles, have an extra set of limbs, despite most other animals including the Martians themselves only having four. This is possibly due to the large amount of genetic tampering the Ancient Martians engaged in. Scientists who were asked to imagine what an alien world would look like, and what sort of creatures might inhabit it, agreed that a six-limbed version of a common land vertebrate wouldn't be too unbelieveable. And not to mention Lakshmi Tatma, the 8-limbed girl. One of the three playable species in Achron is the Vecgir. They are a species that walk on two hind legs, stand about two meters tall and have two pairs of arms. The Warcraft games have basilisks, crocolisks, and diemetradons, all of which have six legs. Very likely a nod to the necessity of a six-limbed reptile template which would eventually evolve into bog-standard fantasy dragons. In the sequel to Crystal Quest, you learn that your Flying Saucer is piloted by a six-legged Space Cow. The Seekers, antagonists of Advent Rising, look somewhat like reptilian centaurs, with a two-armed humanoid torso supported by four legs. Interestingly, while their hind legs end in hooves, the forelegs have hands that are strong and dexterous enough to handle weapons; they are also seen to tuck the forelegs against their hind ones, standing upright at twice the size of any human. Galdon, the boss of DarkIce Mines in Star Fox Adventures is a six-limbed (four legs, two arms) carnivorous dinosaur with small tentacles on the sides of its head. It has a figure that falls somewhere between that of an insect and a centaur. Not that you can tell from their in-game portraits, but the Paranid in the X-Universe series have two sets of arms. The Necho Cat and Frootz Cat dream eaters in Kingdom Hearts 3D have three pairs of legs. Oddly, they're the only examples of the trope among their kind. Inverted with the sligs of the Oddworld series. They're reptilian-looking creatures with arms and a torso, but no legs. Played straight with the Vykkers, who have seven limbs: four legs and three arms. One of the Gisterdamen mounts in Girl Genius looks something like a horned, many eyed six legged giant salamander. Sierks and Ratamis in The Interstellar Tea House have six legs. Avatar: The Last Airbender has Appa the six-legged bison among others. In Tiny Planets, one of the alien protagonists has six limbs, which are usually legs although the front pair can also be used as arms. A land vertebrate is shown with either four legs or arms and legs in addition to one or more wings or the remains of wings. Western dragons are typically depicted as having four limbs and one pair of wings. Eastern dragons are sometimes presented as having as many wings as they do legs - pairs of both running all along both sides of their long serpentine bodies. Likewise, griffins also usually have four limbs and a pair of wings. Though, again, sometimes they only have two legs. And in some older myths, the female has wings, and the male has enormous spikes protruding from its shoulders. Pegasus, the flying horse in Greek Myth, has four limbs and a pair of wings as well. The peryton from the Classical Mythology, a pegasus style animal only being a winged deer rather than a winged horse (and carnivorous, but that's another story). There's a recent tendency to portray it as a bird with a deer's head however, probably based on D&D. Semargl, a Slavic god, takes the form of a winged dog. Thai myth has a lot of fantastic mix-and-match critters, including numerous winged, six-limbed vertebrates. Among them are flying kirins, winged horses, a sort of griffin called kraisorn puksa, and even flying elephants. The titular God-monster in Q: The Winged Serpent has four legs and two wings. A man was driving on a country road, when he saw a chicken with four legs. The chicken started running alongside the car, easily keeping pace, then turned into a farm where there were several other four-legged chickens. He stopped the car to get a closer look at them, and was greeted by the farmer. "Where did these chickens come from?" he asked. "I breed them," the farmer replied, "Me, the wife, and our two kids all like chicken drumsticks. So I decided to breed a chicken with four legs, so we could all have one. And after years of hard work, I managed it!" "That's amazing," said the man, "And what does it taste like?" The farmer sighed. "If I ever catch one, I'll tell you." Hippogriffs, Thestrals, and Dragons in Harry Potter. Oddly enough dragons in the movie verse avert this. Their wings are part of their forelimbs. In Dragonriders of Pern, dragons are genetically engineered creatures descended from fire lizards, which also have four legs and wings but are much smaller. Also native to Pern are wherries, another fire-lizard-related species, which also have four legs and two wings. Tunnel snakes, who share a common ancestor with fire lizards and wherries, also have six limbs. In this case, instead of wings, they have three sets of legs; the front set adapted to digging. Six limbs could well be the norm for vertebrates on Pern, but thanks to Thread nearly sterilizing the planet every 250 years, there wasn't a lot of genetic diversity on the planet before humans came along and introduced Earth flora and fauna. Incidentally, supplemental material indicates that Pernese arthropods have four limbs. Kinshaya in the Star Trek Novel Verse. They have four legs and wings on their back. In an ancestral species, these were used for flying, but modern Kinshaya are too heavy and retain them for display purposes. In Robert E. Howard's Conan the Barbarian story "Queen of the Black Coast", when they spot the ruins, they also spot a winged ape. The Borijans of James P. Hogan's The Immortality Option are an interesting take on this: their planet's vertebrates are six-limbed, but the intelligent species, the Borijans, are descended from birdlike creatures. So they have six limbs, but two are arms, two are legs, and two are vestigial wings. In The Magician's Nephew, a normal Earth horse winds up in Narnia and is given wings by Aslan. Dungeons & Dragons has dragons, winged serpents (which aren't this trope because that's two limbs total), and many others. The Kraken from Evolve has four legs for walking and two limbs that act as both wings and bludgeoning weapons. Rouge from Sonic the Hedgehog is a white bat with separate arms and wings. The Warcraft games also have many creatures with four legs and wings (such as dragons and gryphons). The World Ends with You has this among the noise forms. Kitanji rules this trope: He goes from no arms and legs as Anguis Cantus, to two four limbs a pair of wings and five heads as Draco Cantus. In The Elder Scrolls backstory, Morihaus, the Aedric demi-god who was sent to aid St. Alessia (as part of her Bargain with Heaven) in her war against the Ayleids, is described as a "winged bull" with functional wings. Several characters in My Little Pony, being pegasi or dragons. And in the Friendship is Magic generation, griffons as well. She-Ra: Princess of Power character Imp possessed two arms, two legs, and two wings. In Transformers, Transformers with aerial alternate modes tend to have four limbs alongside the wings of their alt-mode. Cats can grow "wings" from matted fur or medical conditions. They can't fly, obviously. Lizards of the genus Draco look like this, but their "wings" (which are only used for gliding) are actually modified ribs. When Mix-and-Match Critters include parts from invertebrates, the result can be a creature that appears to be a land vertebrate, but has more than four (and often much more than four) limbs. Dungeons & Dragons: driders , manscorpions, and others. The Cray from the Perdido Street Station sequel The Scar have a humanoid upper body and crayfishlike lower body. The Octo-Parrot that appears once in The Simpsons. "Waaak! Polly shouldn't be!" Ursula, the main villainess of The Little Mermaid, is half-octopus. This is most noticeable when she is electrocuted at the end of the film. Bleach: Yammy has a released form of a centipede-centaur. Basically a giant human but with seven extra legs along a torso extending behind him. Snakes with arms: similar to Centaurs, but with the back end of a snake rather than a horse or other quadruped. Dungeons & Dragons gives us Yuan-Ti Abominations, and Mariliths (who overlap with Multi-Armed and Dangerous). Magic: The Gathering often has snake-people featured as snakes with arms, but one block (Kamigawa) contained snake-people with four arms, two legs, and no tail. City of Heroes has a "snakes with arms" villain group called "The Snakes", as well as allowing the creation of player characters with wings, both organic and artificial. The Naga — super-sized snakes with human bodies from the waist up where the snakes' heads would be. They're originally from Hindu Mythology and are now found in quite a few different fantasy series. The aforementioned DnD creatures may be Naga, but from the description above, probably not. Some depictions of Naga feature two or three pairs of arms, and no legs; usually, the most divine members of the species. Others have another snake head at the tip of the tail. Warcraft's depiction of the Naga has two-armed males and four-armed females. Guild Wars has different breeds of Naga, some looking like straight up giant snakes with arms, others with cobra hoods. In Werewolf: The Apocalypse, Nagah are wereserpents who can shapeshift into five forms: a human, a scaly hairless humanoid, a giant cobra with arms and long claws, a giant snake with gills that can sprout arms when necessary, and a normal snake. Some depictions make their arms as bendy as a snake's spine, just to really weird it up. Bulldogs! , a sci-fi RPG, includes a naga-like species called Saldrallans among its core player races. In Pathfinder it's common for a summoner's Eidolon to end up with a large number of limbs, as increasing their number of attacks per round with extra arms, tails, tentacles, or heads is one of the easiest and most effective ways of boosting their power. In Real Life the prehistoric reptile Coelurosauravus, a relative of lizards that lived during the Permian Period, had four legs and two gliding "wings." Unlike today's gliding lizards, whose gliding membranes grow on spread-out ribs, Coelurosauravus's "wings" were an entirely unique set of bones not connected to its ribs. Their morphology suggests they evolved by ossification of connective tissues in the skin, though that's the sort of thing that almost never fossilized so it's difficult to confirm. Monsters, Inc. fanfiction: Randall's ex-girlfriend Sylvia Schneider from Angela's Pet Monster is a wolf with four legs, two retractable arms, and a pair of wings. Demon King Samrick of Charby the Vampirate has four arms, two legs and a pair of wings.